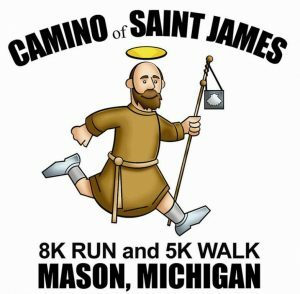 St. James Catholic Church will be hosting the 8th Annual Camino of St. James 8K Run & 5K Run/Walk on Sunday, August 12. One-third of the proceeds will be donated to STVCC. The race will start and finish at St. James, and the course will run through the Mason city streets and the beautiful Hayhoe Riverwalk. All those who enter will receive a free pancake breakfast. The 8K and 5K runs will begin at 8:00 a.m., and they will have additional shorter free runs for children 12 and under beginning after 9:00 a.m. The pancake breakfast is scheduled for 9:30 a.m. Awards will be given for the first three males and first three females in different age categories. Late registration and packet pickup will occur on the evening of Saturday, August 13 from 6:00 – 8 p.m. and on the morning of the race from 6 – 7:30 a.m.
St. James Church is located at 1010 S. Lansing St., Mason, MI. For more information, please visit https://runsignup.com/Race/MI/Mason/CaminoofStJames8K5KandFunRuns.